East Glasgow history . Gorbals . Oatlands Parkhead Robroyston Rutherglen . Ella, New York USA .... I have been out of the country for many years, and the railway bridge in Dalmarnock Rd. 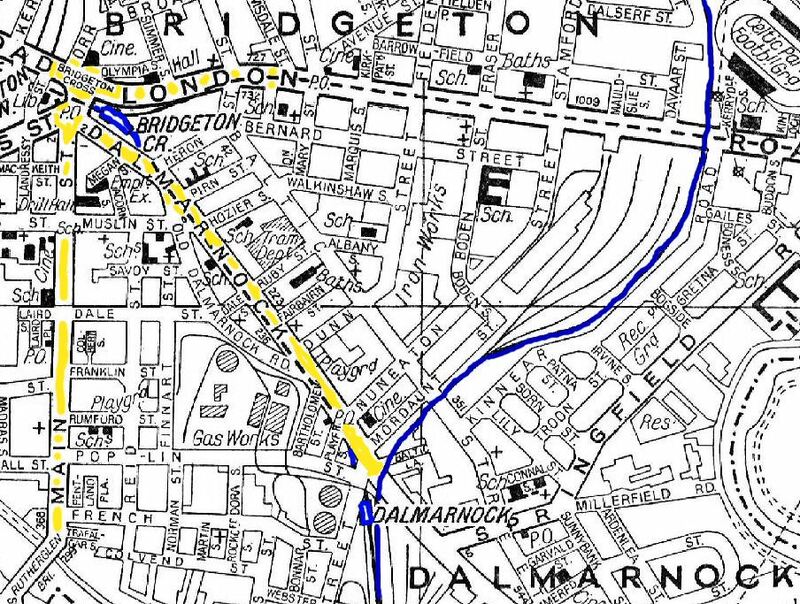 was always the dividing line between Dalmarnock and Bridgeton, at least it was when I lived there. Chrissie, Glasgow .... Bridgeton becomes Dalmarnock at Ruby Street hence the tram depot was called Dalmarnock Tram Depot, Dalmarnock Primary School etc. DESCRIPTION OF BOUNDARIES OF NEW WARDS. I. Ward, Dalmarnock. — That portion of the City comprehended within a line drawn from the centre of Bridgeton Cross southwards along the middle of Main Street and Rutherglen Bridge to a point where the middle line of said bridge intersects the middle line of the River Clyde ; thence up the middle of the River Clyde to a point in the Municipal boundary of the City where it strikes off from the River Clyde opposite the south-eastern boundary of Westthorn Waterworks ; thence north-eastwards along the said boundary line to the middle of London Road; thence westwards along the middle of London Road to the centre of Bridgeton Cross, the point first before described. II. Ward, Calton. — That portion of the City comprehended within a line drawn from the centre of the Cross of Glasgow southwards along the middle of Saltmarket and Albert Bridge to a point where the middle line of said bridge intersects the middle line of the River Clyde ; thence up the middle line of the River Clyde to a point where the same is intersected by the middle line of Rutherglen Bridge ; thence northwards along the middle of said bridge and Main Street to the centre of Bridgeton Cross ; thence westwards along the middle of Canning Street to a point opposite the middle of Clyde Street ; thence northwards along the middle of Clyde Street and Abercromby Street to a point in the middle of Gallowgate; thence westwards along the middle of Gallowgate till it reaches the centre of the Cross of Glasgow, the point first before described.